A big, barking dog can be intimidating at the best of times, CNN reports. Maybe even more so when it's standing next to Russian President Vladimir Putin. Two Japanese journalists grimaced as Putin brought his dog Yume into the room before an interview Wednesday.With the presidential pool cameras clicking, the 4-year-old Akita began to bark loudly at the visiting journalists, who stood there frozen, smiling awkwardly at the boisterous pup. Putin beckoned the dog over to him to give her a treat before leading her through a series of tricks. 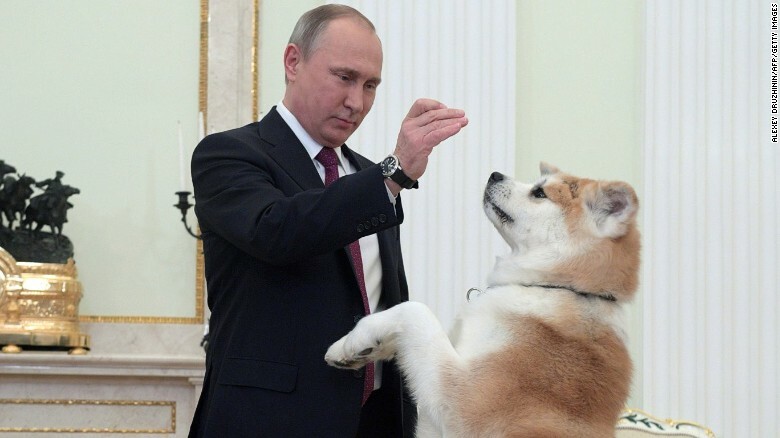 Russian President Vladimir Putin plays with his dog Yume prior to an interview with Japanese media. "You were right to take caution," Putin later said to the journalists. "Yume is a no-nonsense dog. There are many people here, with camcorders running, lights shining and cameras clicking. She is being a guard dog."